A few years ago, a former Mayor of Portland, Oregon asked me the question “why are immigrant rights human rights?” I responded with a clumsy jumble of words having something to do with the United Nations and about ten other things adding up to a total of about 11 too many ideas all poorly spoken. The Universal Declaration of Human Rights was written in 1948, three years after the end of World War II. The Nazi atrocities that came to light during that war inspired the United Nations to convene The Commission on Human Rights to draft a the Declaration as a foundation upon which the Commission would create covenants and conventions that aspired to ensure that atrocities like those committed in Nazi Germany could never be repeated. Approximately 6 million Jews were killed by Nazis. In addition, between 250 thousand and 1.5 million Romani, 25,000 LGBT people, 2-3 million Russian prisoners of war, and as many as 2 million ethnic Slavs were also killed. 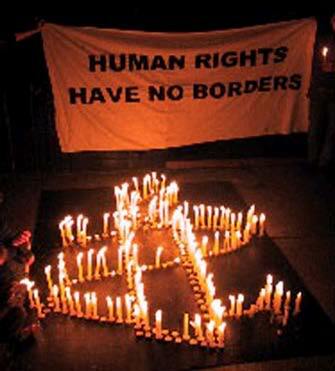 In the face of such horrors, it was deemed necessary to acknowledge the right of people to move freely, including the right to cross national borders and seek asylum from persecution and oppression. That’s why immigration is a human right. Today, in order to live by the spirit of Universal Declaration of Human Rights, if not the original wording of its writers, we have to address the many forces beyond war and political persecution that drives global migration. For example, consider Mexico. Unfair U.S. trade policies such as the North American Free Trade Agreement have devastated the Mexican economy. It is the most powerful force driving Mexicans to immigrate to the U.S. without documents. These people over whose heads we are fighting about “illegal” immigration are economic refugees. And they are only among the latest wave. For decades, U.S. agribusiness has laid claim to rich agricultural lands in the global south. Once there they turn farmers into farm workers and inwardly directed economies where people grow crops and make things they themselves consume into outwardly directed economies based on growing single crops such as pineapples, or sugar for export. The people of these communities become dependent on the wages they receive from multinational corporations and their local contractors. Over generations, they may even lose the knowledge necessary to return to what they once were. Regardless, when more profitable labor markets open elsewhere, companies leave and communities are devastated. People are impoverished and then driven out, forced to follow the money. But though capital is free to cross borders, people are not. By building fences legally or literally, we are banishing them to a kind of poverty most of us in the U.S. could not begin to imagine. And agribusiness is only one type of enterprise that is robbing people around the world of sovereignty and self-determination. Our understanding of human rights must adapt to a changing world. As long as capital can move freely, making people dependent on foreign incomes, people should be able to follow the profits they helped to produce, even if it means crossing our national borders.